Now that I have a little one there are so many products I honestly feel I don’t know what I would do without. I am going to share with you mommies and mommy to bes one of them that has worked for me and totally made life easier for Mason and myself! Graco seems to never let me down! 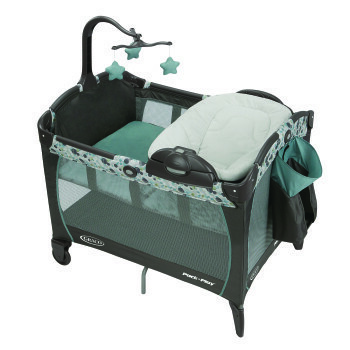 Graco’s Pack ‘n Play Playard Portable Lounger & Changer is something that I use everyday, it just makes life a lot easier! What is it that I enjoy so much about this playard as opposed to others? It’s the fact that it’s a place where baby can be changed, play and lounge in. It also comes with a removable bassinet perfect for a newborn, like my little Mason. I love the fact that this product is something that is going to be used from the newborn stage all the way to when the little man becomes a toddler. This is the kind of thing moms need in their lives. Having a baby is pricy, so if we can have an affordable must have playard for our little one that is going to be used for years that’s all you can ask for. I do not have a negative thing to say about this so let me tell you the features that I feel are great and make this worth having. -It comes with a bassinet that sits on top of the playard, I mean every morning Mason gets put in there and he loves it. If he falls asleep I just put him in there and get a little while to relax which I love! -It is easy to clean so you can be sure no spit up, vomit or poop is going to ruin this baby! -I know some people think yeah really cool it has a mobile sarcastically BUT that being said when baby is lying in there he stares fixated at that thing forever! I mean who doesn’t love blue stars? -At the side it comes with a diaper stacker which is great especially if you live in a house and have to run up and down the stairs to the change table. The stacker fits in your diapers along with any other essentials you need to keep that bum soft! 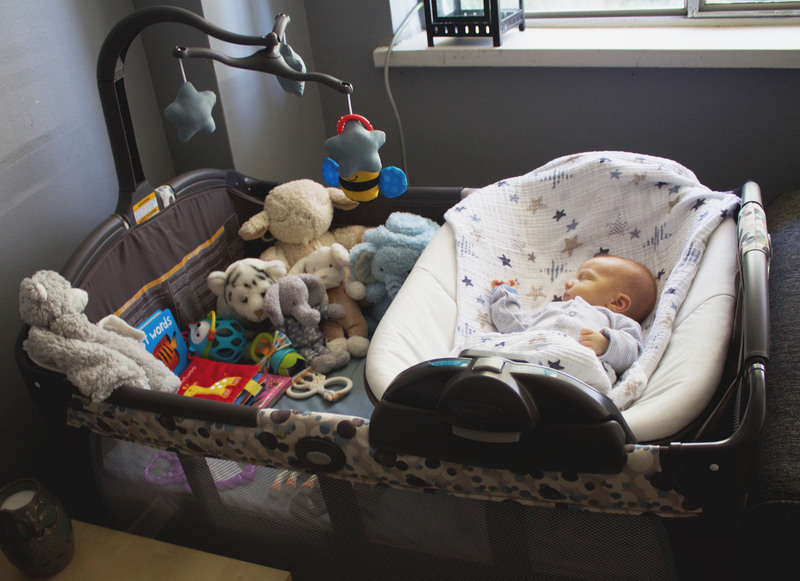 -It serves as a change table, bassinet and playard…. Even though I already talked about this I cannot stress enough how much easier this makes life. -The bassinet is removable and we are able to take it anywhere we go. Its not big at all so bringing this bassinet for the ride wherever we are going it anything but an inconvenience. So everyone the Graco’s Pack ‘n Play Playard Portable Lounger & Changer is something that is worth the money (and affordable on that note) and something that is not just used for baby for a year but years to come. Want to travel around with it? No problem because it has wheels and a storing bag to make life that much easier! 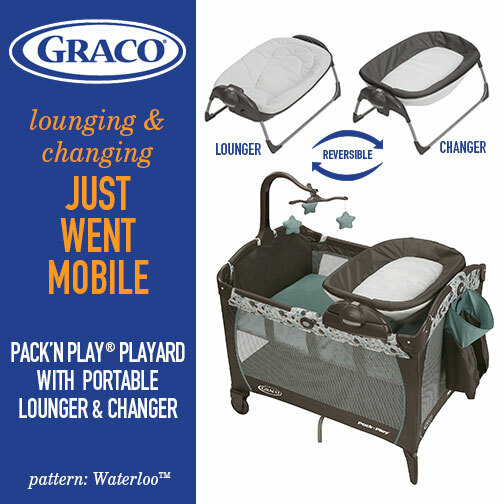 SALE ALERT: The Graco Pack ‘n Play Playard Portable Lounger & Changer is usually $239.99! Currently is it on sale apart of BabyFest at Babies R Us for $139.99 so grab yours today!